The only microfiber towel worthy of the Wolfgang name! The Wolfgang Concours-Series Microfiber Towel is an exceptionally soft, edgeless towel that is designed for buffing off polishes, waxes, and paint sealants. The Wolfgang Concours-Series Microfiber Towel weighs in at an impressive 460 g/m2, making it thick enough for all your detailing needs, without the annoying drag normally associated with towels this thick. At 16 x 24 inches, The Wolfgang Concours-Series Microfiber Towel is large and easy to fold into smaller, more manageable sizes. 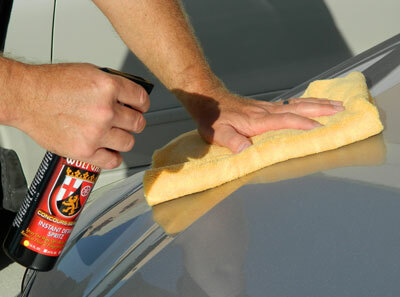 Use with Wolfgang Instant Detail Spritz to add instant gloss and protection to your vehicle's paint. Edgeless design virtually eliminates any chance of scratching! The first thing you’ll notice about the Wolfgang Concours-Series Microfiber Towel is its edgeless construction. By constructing a towel with no edge, the possibility of scratching the paint is virtually eliminated. This super plush, fluffy microfiber towel glides effortlessly across your paint. Wolfgang is a name that’s synonymous with ingenuity, and the first microfiber towel to be branded in the Wolfgang line is no exception. The Wolfgang Concours-Series Microfiber Towel is the perfect balance between a lightweight towel and a thick, plush towel. At 460 g/m2, the Wolfgang Concours-Series Microfiber Towel is perfect for all your paint polishing and waxing needs. The Wolfgang Concours-Series Microfiber Towel is thick and fluffy; rest assured it will not scratch or mar delicate paint finishes – black included! Use the Wolfgang Concours-Series Microfiber Towel with confidence. This luxurious microfiber towel has been tested and approved for use with all Wolfgang polishes, waxes, and detail sprays. For best results, wash the Wolfgang Concours-Series Microfiber Towel with Wolfgang Microfiber Cleaner & Rejuvenator after each use. This concentrated cleaner is specially formulated for microfiber towels and tools. Merchant Response:Larry, After you wash the towels they will not lint. This goes for all microfiber towels we carry. Best microfiber I tried! This is the best to use when dusting and detailing my car. The fiber is very soft and trap dust and light dirt without scratching paintworks.